There's been a good deal of digital ink spilled recently over whether the sesquicentennial is over. A provocative question can erupt into a torrent of thought. But those thoughts have been brewing in my mind for a while now, since the whirlwind here in Gettysburg died down to a dull roar from the fever pitch of a few weeks ago. The tourist tide has subsided. The streets are easier to drive. But most importantly, the press inquiries have died away. Nearly every day of the anniversary week, I had an e-mail or a voice-mail asking me to help a reporter with a project here or there, reporters who were clambering for some way to cover the sesquicentennial from a unique and intriguing angle. It was an amazing feeling, to have my vocation suddenly in the spotlight. But that stopped July 4th. The press stopped beating down the doors, stopped calling the college's press contact list. The story was over. 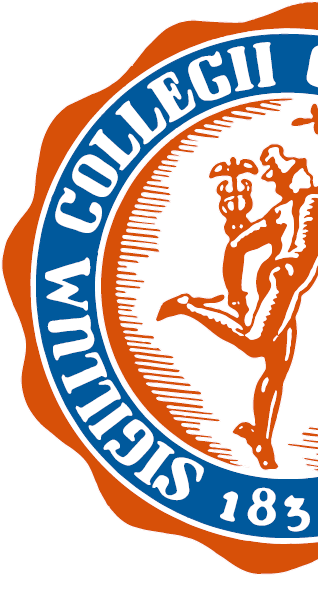 Is the sesquicentennial over? From one perspective, of course not. Brooks is right; there are still two years of war left to fight, to commemorate (hell, even to celebrate if that's your bean). The war is far from over. But what is over then? Because this sure feels like over if ever there were an over. The end of Gettysburg means the spotlight, that powerful beam shone by the collective national attention, is gone. From April of 2011 until now, we in the Civil War community have had the benefit of that bright spotlight of attention, as the whole nation has been (to greater or lesser extents) focused on the war. Media has been seeking out the story. Culture has been buzzing. Hollywood has been filming and premiering. But the war after Gettysburg morphs into that long, bloody, messy slog across Virginia or Tennessee and Georgia. It changes from prisoner exchanges into prison camps and the bloodiest ground on the American continent. Politics gets ugly, as Peace Democrats make a true, concerted effort (and nearly succeed) at unseating one of modern America's most beloved historical figures. Battles become racialized, as men are massacred in battle not simply because of the color of their uniforms, but because of the color of their skin. The war gets ugly. So, the Sesquicentennial is over. The era of the media or culture shining a spotlight on us is at an end, for the sheer fact that they know that what that spotlight will show is bound to be ugly. Fort Pillow or the Crater? That spotlight we had was an amazing opportunity to sell the relevance of the war in amazing and powerful new ways. We had the opportunity, with little to no effort, to help Americans see the war as relevant to their daily lives, to who they are as a people and to what their nation is today. We can debate whether we squandered that 2-year-spotlight or not, and likely will for decades to come. But the fact is, the spotlight has likely been doused. This doesn't mean the commemorations stop. It simply means the work gets infinitely harder. Where before culture and the media were amplifiers for the message that the Civil War is relevant to the average American, now we're going to need to make our own megaphone. The new messages will be harder to spread; the new audiences harder to draw. But the world can still go on turning if you let it. As for me, I plan on continuing to keep trying to help Americans, all Americans and not just the folks who already come to our Civil War sites, to find their own personal relevances in these places. That battle just becomes infinitely harder, and the odds seem set against us as the last few days of July fade away. Sort of like it did for a 87-year-old nation on the brink of collapse 150 years ago. Stewart W. Woods: A Peculiar Casualty at Fort Wagner? There Be Squalls Ahead: This post deals with historical uncertainty and represents some research-in-progress. This story is still half-researched and needs some more work. Viewer discretion is advised. Captured in the darkness of July 18th on a sandy beach in South Carolina was a native of Adams County. Stewart W. Woods, born in Heidlersburg around 1836, found himself in the hands of the rebels, among a handful of his compatriots in the 54th Massachusetts. The fighting of Woods' war was over and his fate was unclear. Stewart was a free man, born under the folds of the same American flag under which he now fought. At some point, he had drifted over the mountain range and called Carlisle home when the war erupted in 1861. But in summer of 1863, Woods' native county was still stumbling bewildered, blindsided by the realities of war. Now Stewart Woods was blindsided by the realities of war too, far from home and excruciatingly vulnerable in the hands of the rebel army. In the 54th Massachusetts, Private Stewart W. Wood was an oddity, perhaps entirely unique. Stewart W. Woods was white. In his Compiled Service Record, Stewart W. Woods' complexion is listed as "white." His eyes were blue, his hair was brown. In the 1850 and 1860 census, although Stewart himself doesn't readily appear, there are no black Stewart households in Cumberland County. One of the larger Woods families in Cumberland County in 1860 was headed by Richard Woods esq, a 56-year-old farmer. According to the shadowy and somewhat insubstantial world of the Underground Railroad in Pennsylvania, Richard Woods was purportedly a local conductor. Richard Woods' son Samuel was the same age as Stewart Woods. Why might Stewart W. Woods have been marked down as "white?" Was his skin just very light? But it isn't marked as "light" in the CSR, but clearly "white." Led away from Fort Wagner, Stewart Woods wasn't dragged to Andersonville or any of the other Southern prisons penning in hundreds of loyal American soldiers. Instead, he and his compatriots became the awkward nucleus of a truly weird set of legal circumstances, as he and his fellows were tried by South Carolina's governor that August for slave insurrection. The soldiers were stripped of their uniforms, treated as common criminals and held inside Charleston's City Jail, where forty years before Denmark Vesey and his co-conspirators had been held under identical charges. But why would a white man undergo such torture? If Woods was white, might he have been in the 54th Massachusetts precisely because he was white? Perhaps as in the South for generations light skinned black men had attempted to pass as white for a measure of freedom, Stewart Woods attempted to pass as black (all it would take was 1/8th of your lineage) in order to fight in a unit truly fighting for freedom. 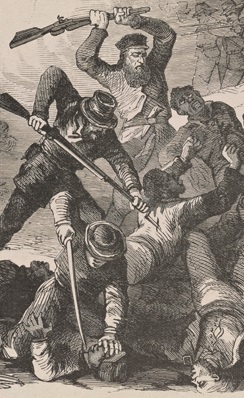 In August of 1863, a criminal trial was called and the captives of the 54th were charged under South Carolina law for conducting a slave rebellion. But the case fizzled; the court decided that the charges overstepped South Carolina's jurisdiction. The soldiers were marched back to the city's prison and held there like criminals for nearly another year and a half, no real trial or charges. And Stewart Woods got sick. Whether Stewart W. Woods was a white man on a moral crusade isn't precisely clear. But that Private Stewart W. Woods was on some sort of moral crusade is clear. 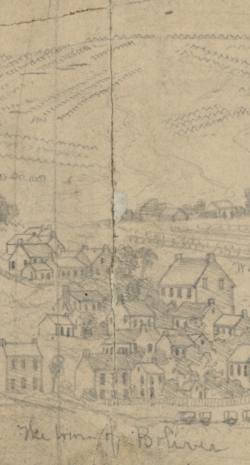 Just a month before he was captured, the 54th Massachusetts marched through Darien, Georgia. 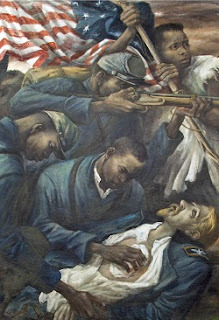 Though Robert Gould Shaw reportedly called the burning of the town a, "satanic act," Woods was content leaving a clear, proud calling card of who had torched the town in slave-holding Georgia. Woods plucked a book from some soon-to-be-charred shelf and scribbled his name in the cover. "STEWART W. WOODS, was born September 21, 1834... Hidlersburg [sic], Adams County, Pennsylvania. 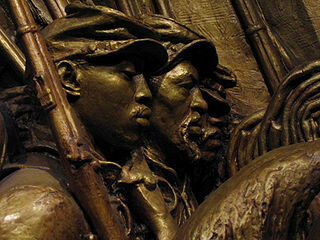 54th Massachusetts Volunteers." He followed those lines with the name of the unit again, content with te flag he fought under and the men he fought beside: "54th regiment, Massachusetts Volunteers, of Col. SHAW." So proud was he of his commanders that he noted all of their names; Shaw, Pope, Higginson and Tucker all were mentioned in the inscription. Then Woods left the book to be found by the citizens of Darien as they wandered back into their wrecked city, wood framed walls charred black like the slaves their state had brokered in for hundreds of years. The book became his calling card, the signature he wrote on the inferno-artwork. Months had passed from that day when Woods proudly burned Darien, Georgia, set torch to sin. By the spring of 1865, he was a shell of a man, the swampy and insanitary conditions of a city jail cell in a tropical city did their worst. He and his compatriots were exchanged in March of 1865, but it was too little, too late. 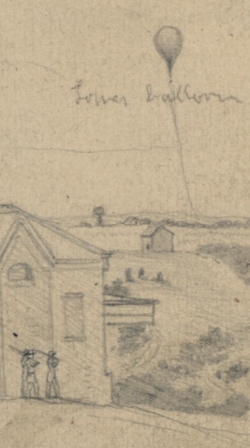 Just 10 days after coming back to Federal lines, in a general hospital in occupied Wilmington, North Carolina, Stewart W. Woods succumbed to typhoid fever. Should one of these faces be white? What else don't we know about the USCT? Was Stewart W. Woods white? Was he the only white soldier in the ranks of the 54th Massachusetts? Did he do it for Abolitionist fervor? He did seem to take glee from a town meeting the torch, a town in a nation fighting to enslave men who looked like those who marched beside him. And Stewart Woods, whether white or black, fought for the destruction of a cancerous institution which had, for centuries, been strangling the vital American organ: liberty. Special thanks to Chris Barr from Andersonville National Historical Site for some clarification and fascinating info on the men of the 54th Massachusetts who were captured during the battle at Fort Wagner. Andersonville has been doing gangbusters work under leadership of Chief of Interpretation Eric Leonard. Check out their Facebook page later today for more about the weird and amazing story of all of the 54th's captured's odd journey to everywhere but Andersonville. Undoubtedly, Stewart W. Woods will continue to bother my historian's brain until this story gets more solid evidence. There is a mother's pension application at the National Archives submitted for Woods. Hopefully that application can help pin down more certain details about Woods' race, life and death. Stay tuned. Standing in the pleasant countryside of Gettysburg, Pennsylvania in the early summer of 1863, it might not have hit you just how quickly the world was changing. That blissful ignorance might have been doubly powerful if you were a young white man, as were the students of Pennsylvania College. For decades before the Civil War, students from Pennsylvania had mingled with students from Maryland, Virginia, North Carolina, and other southern states at Gettysburg’s local college. In classrooms and laboratories, sons of slave-owners studied right alongside the native sons of the Commonwealth, cradle of liberty and birthplace of Independence. The fact that many of those students from Virginia and Maryland were now gone, their educational endeavors the cruel victims of a terrifying war, was one bruise among many which Pennsylvania College bore because of its close relationship with slavery. Gettysburg’s carriage industry drove the ties to the South’s peculiar institution. Fine carriages made in local workshops rolled south into the palatial stables of wealthy planters in the Old Dominion and further south. In turn, the South sent her sons and tuition dollars northward for a fine Lutheran education. As the nation seemed to shudder and crack in 1860, during the tumultuous election that would see Lincoln ushered into the White House and South Carolina and her friends ushered out of the United States, North Carolinian William D. Anthony sat at his desk in Pennsylvania College studying Latin, Greek and analytical geometry. America was fracturing over the question of slavery as he sat in Gettysburg alongside classmates from Pennsylvania, Maryland and the capitol at Washington City. Back in North Carolina, John B. Anthony, the toiling student’s father, preached the gospel of love in a Lutheran Church outside of Charlotte. At home, he had a wife and five other children. He also owned one human being who worked around the family's home: a 45-year-old black woman. In the College Edifice in Gettysburg, William Anthony could have glanced out the window and seen John "Jack" Hopkins working in the grove of trees surrounding the school’s buildings. Hopkins, the college’s janitor, and his family lived in a small home on the north edge of the campus. Whether Anthony paid heed to Hopkins, noticed the man at all, is unknown. But in just a few years Hopkins and Anthony would be set at odds, opposite ends of a convoluted and dangerous spectrum. The college has a yearbook from the 1860s in its historical collection, still available to view, touch and leaf through in the library’s special collections department. Underneath Jack Hopkins’ picture is the smiling hand-written notation, “Our Vice-President.” A joke to us because the janitor of a college almost certainly could never become this college’s vice-president. ; a joke in the 1860s because an African American almost certainly could never become any college’s vice-president. Who exactly wrote the joke, be they southern son or local Pennsylvanian, is not exactly clear. But that joke would shortly be upended. War was coming and the gears of a mighty machine of progress would be set in motion that would mean men with skin the hue of Hopkins’ could be the leaders of colleges, businesses and even the United States itself. And the war came. William Anthony returned home to the south. When Confederates invaded Pennsylvania in June of 1863, Anthony came along with them. He was astride a horse, the bright yellow chevrons of an Ordnance Sergeant on his shoulder. In charge of dolling out weaponry and ammunition to the soldiers in his regiment, William D. Anthony rode back into the Keystone state along with the 1st North Carolina Cavalry. As the horses and wagons of the Confederate Army poured over the border into Pennsylvania, Gettysburg saw an exodus. Hundreds of black citizens from the town and surrounding countryside disappeared. They ran for their lives. The oncoming Confederate tide meant capture and slavery, it meant never seeing home or family or friends again. It meant torment and maybe death at the hands of the South’s Peculiar Institution. Somewhere in the forlorn and pitiable throng escaping Gettysburg and running for safety to the north or east were Jack Hopkins and his family. The janitor was perhaps one of the wealthiest black men in the entire town. But his prestige could not save him from the oncoming tide of rebel troops. His skin color was a giant target drawn on his freedom. So he ran. Both Anthony and Hopkins would survive the invasion unscathed. Anthony survived the campaign, fighting on July 2nd at the Battle of Hunterstown only five miles from the desk where he had studied Greek and plane trigonometry a few years before. The 1st North Carolina Cavalry limped back to Virginia along with the rest of Robert E. Lee’s battered army. Jack Hopkins and his family returned home after the rebel tide subsided to find their home on the college’s campus in shambles, but their lives together in freedom safe and intact. And as the smoke drifted away from the battlefield at Gettysburg, America continued changing. The machinery of Lincoln’s Emancipation Proclamation ground slowly, deliberately away against the institution of slavery. A war to save the nation, “a nation conceived in liberty and dedicated to the proposition that all men are created equal,” as Lincoln would phrase it that fall, was welded onto a war to destroy slavery once and for all. And even viewed from the now blood-soaked fields of Gettysburg, that war was obviously changing. 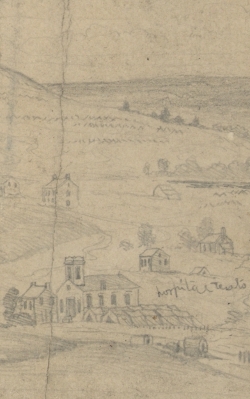 Jack Hopkins’ son Edward would join the United States Colored Troops that winter, heading south to fight the army that had invaded his hometown and threatened his family’s freedom. And America took one more tenuous step forward on the long road toward equality. I'm writing this standing near the spot where you died, exactly 150 years ago nearly to the second. Im typing on a tiny screen, a technological marvel that lets me share the stories of men like you with the world instantly. They've put up a monument to you and the 17 other men who died along with you along the banks of Plum Run creek. We call this place "The Valley of Death" now. I think you among all people who have walked this green earth would understand why. I mourn your death. I don't rightly understand why, to be honest (no offense). You've been dead a century and a half, anyone who ever loved you and hugged you and lectured you and scolded your transgressions and looked up to you as their honest son or brother is long gone. I never knew you. And yet I mourn. I stand in front of this cold slab of marble and bronze and I can't help but cry. I still can't tell exactly why. God, how things have changed since you died. No, not simply since. Because you died. Men walk free because you died. Out nation is whole because you died. I can stand here and mourn you today a free man in a free nation that is always trying to extend that freedom to the darkest corners of our own nation and the globe because you died. I wish I had known you. Not a day goes by living in this town I don't wish I could have met you. I live just up the road from where you die; your blood in this soul brought me to plant my feet here. I don't know why you fought. It pains me that I don't know. Maybe it was to free 4 million men held beneath the cruel yoke of a terrible and deadly institution. You certainly grew up in a hotbed of progressive thought on who in America should be free an why we all should fight for that freedom. Maybe not. Maybe it was because you wanted adventure. You certainly found it here, a terrible, horrific adventure from which you couldn't escape. A British author, in a children's book he wrote long after your blood mingled with this dust, wrote that, "to die will be an awfully big adventure." Maybe it was. Maybe it was to defend your nation. You did, after all, join the U.S. Regulars, not some fly-by-night volunteer unit from Madison County. I've always thought that meant something, like you had more of a dog in this fight than just defending home or hearth. You defended that Constitution, that Declaration, that beautiful flapping flag. I do know you wavered. I've read your private letters, and for that I apologize. Hopefully you won't mind the prying eyes of a nephew descendent glancing at your words. I know you thought about desertion in 1862. I respect you all the more for that. Fear is natural. It's the right reaction to war. I'd be more worried if you weren't fearful, weren't scared, didn't have trepidations. The flag I put on your monument on Memorial Day is gone, someone plucked it from its perch here. Memorial Day is the day we've set aside to honor you and all the other sainted dead who have died defending our nation. I forgot to get a new one at the store, so I visit flag-less today. I hope you don't mind. I'm here. I hope that's enough. It's beginning to rain, big salty drops on the screen of my phone and I don't think they're coming from the clouds, but they're making it very hard to type. So I will close for now, thanking you for everything you gave that this nation might live.